Every quarter, the Office of Environmental Policy and Sustainability releases a community newsletter with all of our projects, news, and accomplishments. You can subscribe to our Community Report email list to stay up to date or you can read our past reports. Esri, the worldwide leader in geographic information systems, awarded Tacoma honorable mention in their 2014 Storytelling with Maps Contest. The City of Tacoma Office of Environmental Policy and Sustainability has received the Government Agency 2014 E3 Green Apple Award for outstanding work providing and supporting environmental, sustainability, and systems learning opportunities. Tacoma is the first of 30 pilot communities to submit and receive STAR certification, the first national community livability and sustainability rating system. Tacoma received a rating of four out of five stars, performing particularly well in the built environment; climate and energy; education, arts and community; and natural systems categories. Read the press release or visit STAR Communities to learn more. The City of Tacoma has released a new Greenhouse Gas Emissions Update Report of 2012 data. This report identified transportation fuels, the built environment, and wastewater treatment as the primary sources of greenhouse gas emission in Tacoma. Learn more about the City's Climate Action Plan here. In honor of Earth Day 2013, the City of Tacoma released its Earth Day Report which highlights the City’s progress towards sustainable operations through a reduction in use of paper, electricity and petroleum fuel. 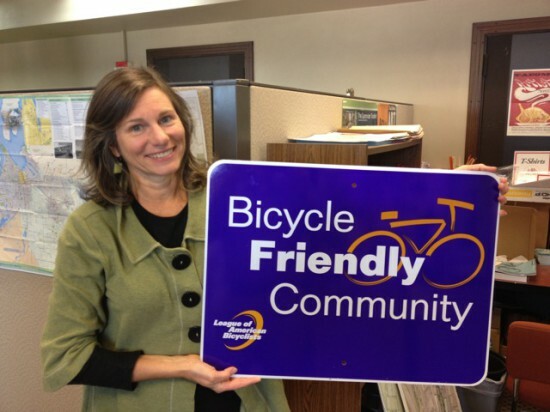 In May 2012, the City of Tacoma was awarded Bronze Level Bicycle Friendly status by the League of American Bicyclists for the City's accomplishments in increasing bikeways infrastructure, educational programs, and engineering and design of facilities. The City will continue to make strides in improving and enhancing bikeways and work toward Gold. Kristin Lynett, manager of Tacoma’s Office of Sustainability, talked about the need to stop generating waste and some of the City's sustainability accomplishments at the 2012 TEDx event in Tacoma. TEDx events are independently organized events; TED is a nonprofit organization devoted to Ideas Worth Spreading. The City of Tacoma and Tacoma Housing Authority won a national Award of Excellence for Sustainable Community Development from The Home Depot Foundation in 2010. View the video on YouTube. Esri, the worldwide leader in geographic information systems, awarded Tacoma honorable mention in their 2014 Storytelling with Maps Contest for our Green Living Map. Tacoma is the first of 30 pilot communities to submit and receive STAR certification, the first national community livability and sustainability rating system. Tacoma received a rating of four out of five stars, performing particularly well in the built environment; climate and energy; education, arts and community; and natural systems categories. Visit STAR Communities to see how Tacoma scored. The City of Tacoma has released a new Greenhouse Gas Emissions Update Report of 2012 data. This report identified transportation fuels, the built environment, and wastewater treatment as the primary sources of greenhouse gas emission in Tacoma. The report is available to read on the Climate Action Plan page. Kristin Lynett, manager of Tacoma’s Office of Sustainability, talked about the need to stop generating waste and some of the City's sustainability accomplishments at the 2012 TEDx event in Tacoma. You can watch her full presentation online. TEDx events are independently organized events; TED is a nonprofit organization devoted to Ideas Worth Spreading.